BUDM executive board members lead a dance. Photo by Jimmy Lafakis. Energetic music, fun activities and smiling faces filled the HRC as they danced away fundraising for a great cause. 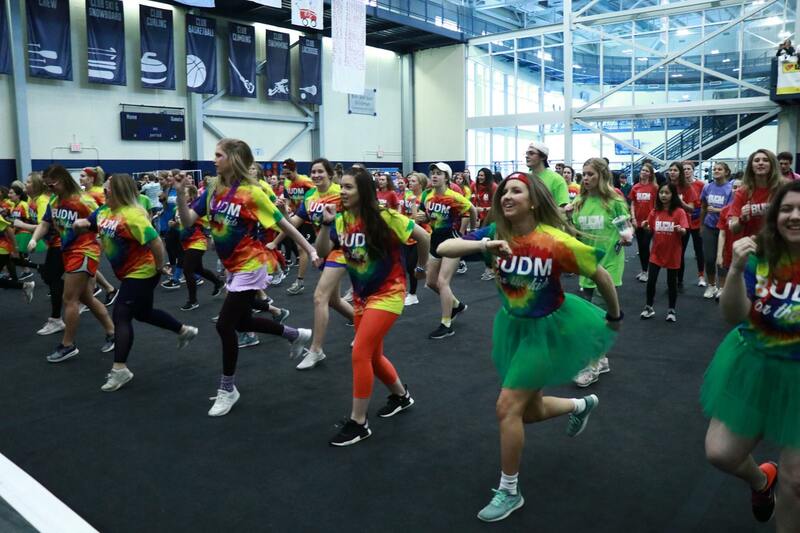 On Feb. 2, the annual Butler University Dance Marathon fundraiser for Riley’s Hospital for Children and cancer research took place at the HRC. Butler students and the children of Riley Hospital participated in dancing, inflatable obstacle courses and games from 11 a.m. to 11 p.m.
By the end of the night, their efforts raised a total of $365,387.39 to donate to the Riley Children’s Foundation, $64,000 more raised in comparison to last year. Kelly Kingston, a sophomore marketing major, participated as an executive member of BUDM for the first time this year. A total of 583 members participated in the event — an increase of 149 people from last year. Those who wanted to fundraise could do so by creating a team, joining a team or as an individual. Through fundraising, the participants can set goals for themselves to hopefully exceed that amount and be a part of a great change. Ethan Schipp, a first-year finance major, joined the morale team this year. He has participated in dance marathons since high school. Bailee Cecil, a junior sociology and political science major, is the BUDM director for special events and contributed to the event. Learn more about the Riley Children’s Foundation at: www.rileykids.org.